Research shows exactly why young athletes should stay in sports. That’s the word from Paul Caccamo, the Harvard-educated executive director of Up2Us, a national coalition of community sports programs that teaches young athletes life lessons. “Sports are more than a game; they are a set of life lessons. Kids growing up without them are really disadvantaged,” he says. The statistics tell you all you need to know about the advantages of participating in athletics, says Caccamo, who received one of Harvard’s most prestigious graduate awards for innovation in social-service program design. So how do you ensure your kids get all these benefits by staying in sports? To understand why children and teens stay in sports, you have to understand why they drop out. The Number One reason: They’re not having any fun. Kids often join sports teams to be with friends and enjoy themselves, but at some point become overwhelmed by the pressure and the focus on winning. Be sure to separate your dreams from your child’s. Sometimes parents have different ideas about what they want from their child’s sports experience. These ideas can undermine their child’s experience. Keep your expectations in check. 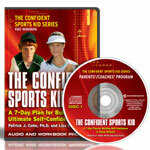 Kids often take on your expectations as their own, and if they don’t achieve them, lose confidence. Help kids manage their own expectations. If a young athlete begins a basketball game expecting to score 24 points, he’s likely to feel frustrated and disappointed. Choose coaches and teams carefully. Be sure to interview potential coaches about their philosophy. It’s best, especially when children are younger, if coaches focus more on skill-building and on having fun than on winning. You can also download audio and video programs that help you and your young athletes get the most out of taking part in youth sports. They include videos you can watch with your children and interviews with experts like Caccamo. What’s More Important? Winning or Having Fun in Sports? I am from greendale middle school in Milwaukee Wisconsin. I support Sports for youth and Your website. I personally think that there should be alot more sports programs for children of all ages. Are you aware of any studys the support youth sports.